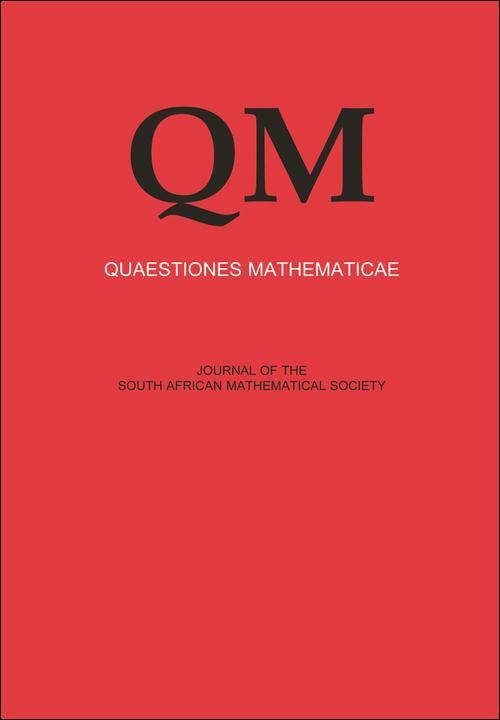 During Professor Barry Green’s report at the South African Mathematical Society Annual Congress he announced that at the end of 2015, following Volume 38, he will be stepping down as editor of Quaestiones Mathematicae and in reflection of the past 17 years noted that it has been a pleasure serving the South African Mathematical Society, first as an Associate Editor for three years and then as Editor since 2002 for 14 years. Associate Editor, Professor Themba Dube, will be taking over as Editor from 2016. In his time as editor, Prof. Green has overseen a period of growth and improvement for the journal. The scope of the journal has grown significantly with Quaestiones Mathematicae being more inclusive and attracting quality contributions from most areas of pure and applied mathematics with the number of submissions being over 300 annually. The journal will see its second frequency increase in recent years going from 6 issues a year in 2015 to 8 in 2016. In addition the journal has seen strong Impact Factor growth with a current score of 0.542. During his report Prof. Green also made reference to the significant roles played by both NISC (since 2000) and Taylor & Francis (since 2007) in the journals development. In celebration of 17 years of outstanding service to Quaestiones Mathematicae, we have made available a list of editor’s picks for 2015 which include 10 papers published between 2010 and 2015. These are available to read for a limited free access period until the end of 2016 by following this link: Editor's Choice Articles. Read a transcript of a 2012 interview conducted by Taylor and Francis’ Katie Chandler with Professor Barry Green on his involvement with Quaestiones Mathematicae here.